When it comes to Nigerian celebrities, one of our favorites has to be Rita Dominic. She has a real effortless style, often killing it on the red carpet (unapologetically) but if you thought the actress has no street style reign you’ll need to take a close look at her recent photos during the GTBank fashion event. 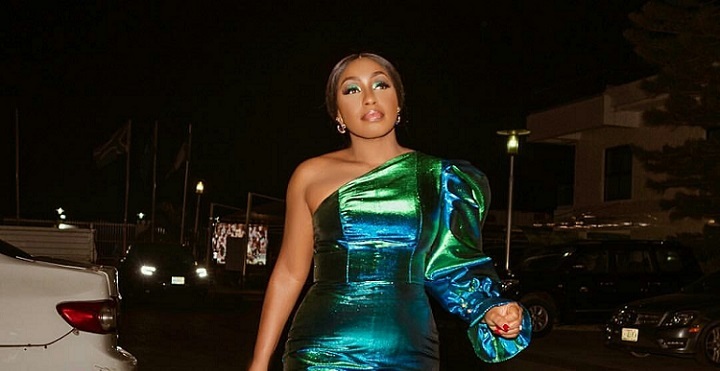 She was pictured pounding the pavements of Oniru Estate in Lagos and rocking a green Lanre Da Silva one-shoulder dress, which featured a seriously exaggerated one sleeve, asymmetrical hem, and a romantic neckline. And here, the actress bravely teamed the clingy ensemble with gold accouterments finished with matching eye-shadow. To say the least, Rita’s outfit was simple yet incredibly chic but then again, we wouldn’t expect anything less from the stylish 43-year-old star. We love fashion and style more than you do.